Got back last Monday from North Carolina; the week following BrickMagic, my wife and I met up with family and vacationed in the Outer Banks for a week. Since we've been back, the LEGO side of my life has been a whirl-wind of activity -- there a new LEGO store opening up in Miami, FL, the Collectable Minifigures (series 1) has started to show up at various TRU around the US, I've added the Cincinnati LEGO store to iPaB, GFLUG is making preparations for Star Wars Celebration V (the big news here is George Lucas will attend), and it's time to gear up for Brickworld in Chicago (it's now over 750 registrants). For those of you who couldn't attend BrickMagic, you missed out on something great... it felt more like a LEGO convention from a few years ago (registration of only 100 people). It was a chance to see some old friend, and make a few new ones. The presentations were light -- most people were still setting up displays & it was a hike from the main ballroom -- in my mind I kept thinking there's got to be a short cut, but there wasn't. 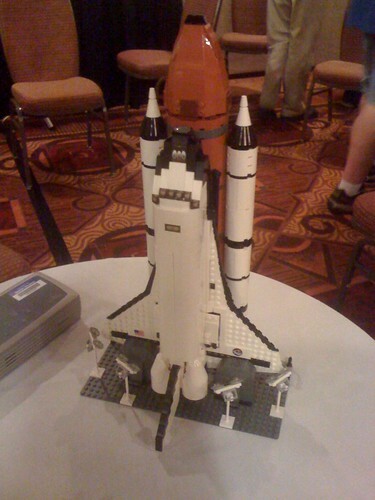 I hadn't reviewed my first presentation on the LEGO community in awhile, and it showed... I've added a few things since I first gave it at Brickworld last year and there's a few more updates I need to make before giving it again (I volunteered to give it again at Brickworld, so tick-tock). The commission build presentation was more informal -- it started out answering questions and turned more into a discussion, than what we do in Brick Replicas. The talk from LEGO were really informal. Steve Witt answered questions -- he looked more relaxed than in conventions past; I suspect because there wasn't (too many) people there heckling him. And it was nice to see the shuttle first hand. I made this mistake of eating sushi and going to a late night showing of Iron Man 2 with everyone Friday night. Woke up the next day with a terrible migraine & wasn't able to officiate the LEGO Boat Race, which was disappointing for me, personally. My LUG-mate Robin Werner ended up running the race, which we learned (1) shouldn't have been held during public hours -- there were hundreds of spectators around a really tiny pool, (2) the public was partaking of the pool before the event, which soaked the walking area around the pool, (3) when the race started, everyone wanted to get a closer look, making it difficult for the contestants to walk around and control their boat, (4) the need for volunteers to keep the crowd back or have crowd on one side, the contestants on the other, (5) a prep area was needed by the pool to work on boats. Sunday was much better; I managed to interact with the public crowd -- and let me tell you, there was a huge crowd on Sunday. Answered questions, talked more with friends, and helped packed up. It was evident that Joe Meno is well loved within the LEGO community. It's not often you see people sacrificing a holiday like Mother's Day to go to a LEGO convention and put out an amazing display -- mostly because he asked. I don't think many people knew what to expect from a LEGO convetion within the area... or maybe they did because of LEGOpalooza, but it was evident that people liked the event -- they ran out of event kits and event t-shirts (which is always a good sign), but haven't heard too many complaints (other than there wasn't enough event kits and event t-shirts). That's a really great narrative. I hope Brick Magic continues to grow in numbers! I glad to hear he was willing to take the risk. Great report, Mike.... Glad to know about the latest news as always, and really excited for the opening in Miami, which will mean that I can go there much more often, shop more, and not be so exhausted of the open road. Sooner or later... I will definitely check out Brickmagic.